Amtrak has announced it will start searching bags. Amtrak passengers will have to submit to random screening of carry-on bags in a major new security push that will include officers with automatic weapons and bomb-sniffing dogs patrolling platforms and trains, the railroad planned to announce today. You know what to do, right? 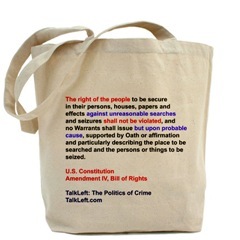 Make sure the bag they search has the Fourth Amendment printed on it. Let the 4th Amendment speak for you as you hand your bag over for a search by a train, subway or airline security guard. It's a silent protest and reminder to authorities that you consider searches without reasonable suspicion or probable cause to be an infringement of your privacy rights. You can get your's here. They make great gifts for college kids who are probably more likely to take Amtrak than we are.